Deep drawn parts are parts that are manufactured using the deep drawn metal stamping process, where a punch and die are used to progressively stamp sheet metal into a finished part. A part is generally considered deep drawn when the depth of the part is at least 1 1/2 times the diameter of the part — parts with shallower depths are considered to be stamped parts, but not deep drawn parts. Trans-Matic Manufacturing Company: a leading manufacturer of deep drawn metal parts and deep drawn metal stamping, with decade of experience in deep drawing low carbon steel, stainless steel, aluminum, copper, and other metals. Trans-Matic has global production facilities enabling them to meet the demands of manufacturers around the world. Tempco Manufacturing Metal Stamping: offers metal fabrication services, including metal stamping for stainless and cold rolled steel and aluminum. Dalsin Industries: a sheet metal fabrication manufacturer offering metal stamping services as well as lazer cutting and other metal fabrication services. Dalsin has over 60 years experience in creating sheet metal parts, including installation of assemblies. Deep drawn parts can fit a wide array of specifications. While the most basic deep drawn part is the basic cylinder, modern deep drawn parts can be nearly any shape, including asymmetrical shapes. Additionally, in-press stations can perform a number of additional operations as a part is being deep drawn, including piercing and threading, allowing deep drawn parts to be press complete with necessary holes, flanges, tabs, and screw threads. This deep drawn part video highlights many of the different kinds of deep drawn parts that can be manufactured via the deep drawn metal stamping process. The variety of different kinds of parts that can be manufactured via deep drawing is far greater than most people realize. Deep drawn parts have numerous advantages over cast or machined parts, though they are not without their disadvantages as well. These advantages aside, the primary disadvantage of deep drawn parts is that deep drawing is not cost effective in smaller quantities. The press setup costs associated with deep drawing are very high and require considerably expertise, making deep drawing prohibitively expensive for small or even moderate runs. Typically the minimum quantities for deep drawn part manufacturing to be cost effective is in the hundreds of thousands, though the cost effective quantity is highly variable depending on the exact nature of the part. 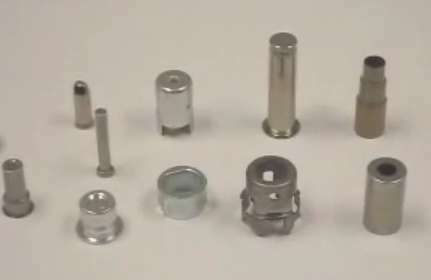 Some deep drawing manufacturers offer off the shelf parts for which they’ve already invested in the tooling, and these parts (commonly varieties of ferrules or grommets) can be purchased in far smaller quantities. Additionally manufacturers may have partial tooling that can be repurposed for projects, lowering the set-up costs.